After I helped organize the REACH Annual General Meeting in June, REACH asked Ian and me to build on that success by working with some of the youth involved with their programming. Part of the success of the AGM was the panel that I helped plan to highlight the work done by Cultural Navigators in their own refugee and immigrant communities. The panel was absolutely compelling as the Cultural Navigators spoke from the heart about their experiences as newcomers to Canada and how they rely on that experience to help newcomers today. The youth we were asked to work with are the products of that newcomer experience, two of them quite literally because their parents are Cultural Navigators. 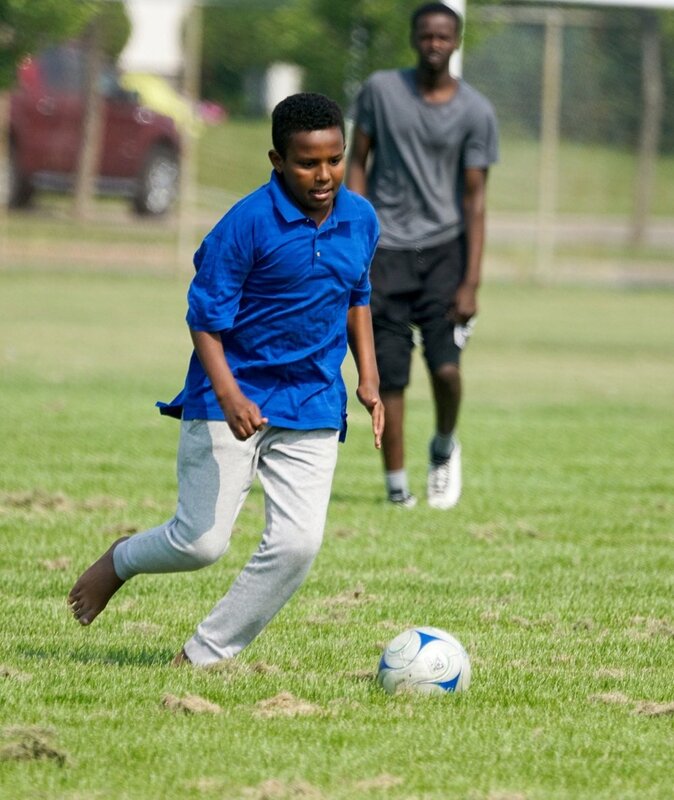 Of the four youth, two were born in Canada and two came to Edmonton as teenagers from South Sudan and Somalia. The idea was that I could use my professional writing and storytelling skills to help the four youth leaders tell their own stories at a conference in the spring of 2018. Ian’s job would be to photograph them to provide the images to make their presentation rock! As with all of our work with REACH, this initiative turned out to be impressive and heartening. The four youth leaders, all university students, were tasked with selecting teenagers and developing programming for the Police Youth Engagement Program or PYEP. This was the fourth time REACH had carried out the program in partnership with the Edmonton Police Service. PYEP has two goals. 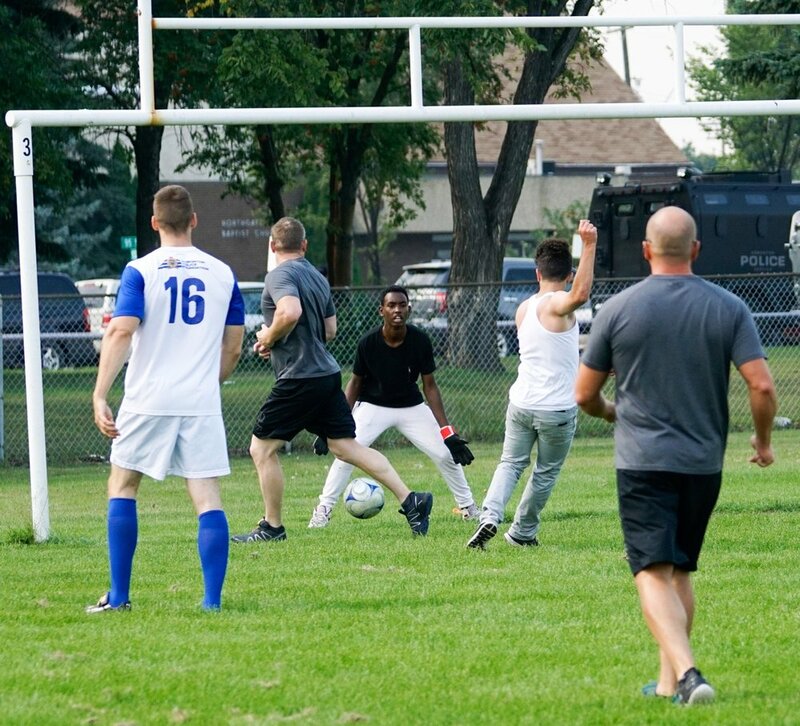 The first is to improve relations between the Edmonton police and refugee and immigrants. The second is a recruiting tool, planting the seed of a future career with EPS, either as a police officer or civilian member. Both goals are ambitious, considering that relations are often strained. At PYEP this summer, the youth demanded answers from senior police officers about racial profiling, a hot topic in the news. And police, in turn, explained the situation from their perspective. The openness and honesty on both sides was encouraging. When I interviewed the four youth leaders, I made a point of asking each of them whether they’d consider a career with the police force. Three of them, all women, said an unequivocal no. Nothing against EPS, they all said, emphasizing that they had the highest respect for the officers involved with PYEP. But a policing career is just not for them. One is aiming for a career as a scientist, one as a poet and the other as a social worker. The fourth, a young man, is studying business and thinking of becoming a lawyer. He’s considering joining the police force as a way of enhancing, and perhaps even financing, his education toward a law degree. Meeting people like the four youth is such a privilege. And because their leadership is not something we see celebrated in the media everyday, we wanted to write about them. Here’s a link to the article Ian wrote, along with some of his pictures, for the September, 2017 edition of The Edmonton Muse.